1 of 5 Heat oven to 375 degrees F. Coat baking sheets with nonstick cooking spray; set aside. 2 of 5 Stir together flour, baking soda and salt in a medium-size bowl; set aside. 3 of 5 In a large bowl, beat together butter and both sugars until light and fluffy, about 3 minutes. Beat in egg and vanilla. 4 of 5 On low speed, gradually add in flour mixture. Beat for 2 minutes or until blended. 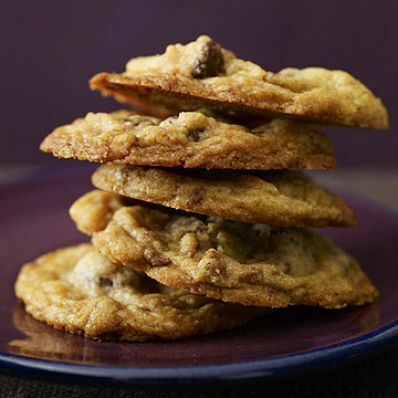 Stir in chocolate chips and toffee pieces. 5 of 5 Drop batter by tablespoonfuls onto prepared baking sheets and bake at 375 degrees F for 12 minutes or until golden. Cool baking sheets on wire racks for 5 minutes. Transfer cookies to wire rack to cool completely.